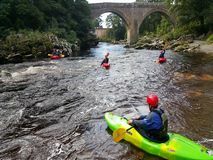 This is a 5 day introduction to inland Kayaking (K2F) in a sheltered water environment. The course content includes clothing and equipment, access and conservation, weather, lifting, carrying and launching, efficient forward and reverse paddling, turning, moving sideways, manoeuvring the kayak in confined spaces, self/group rescues and participating in a journey. The outcome of this course is for the candidate to demonstrate a competent level of skill as a member of a team led by a qualified Paddlesport or Moderate Water Leader.